Coolidge Elementary fourth-grader Shannon Yan stepped up to the microphone, took a deep breath and spelled her way to victory during Coolidge’s annual spelling bee on Feb. 1 with two words: “ornament” and “uninhabited.” Click on the story headline to read more. Coolidge hosts the District’s only spelling bee and invites fourth- and fifth-graders to participate. This year, 11 Coolidge students accepted the challenge and competed for nine rounds before Yan took home the engraved bobble-head bee trophy. Fifth-graders Miley Trinh and Warren Lukman were awarded second and third place, respectively, and received engraved medals and ribbons. 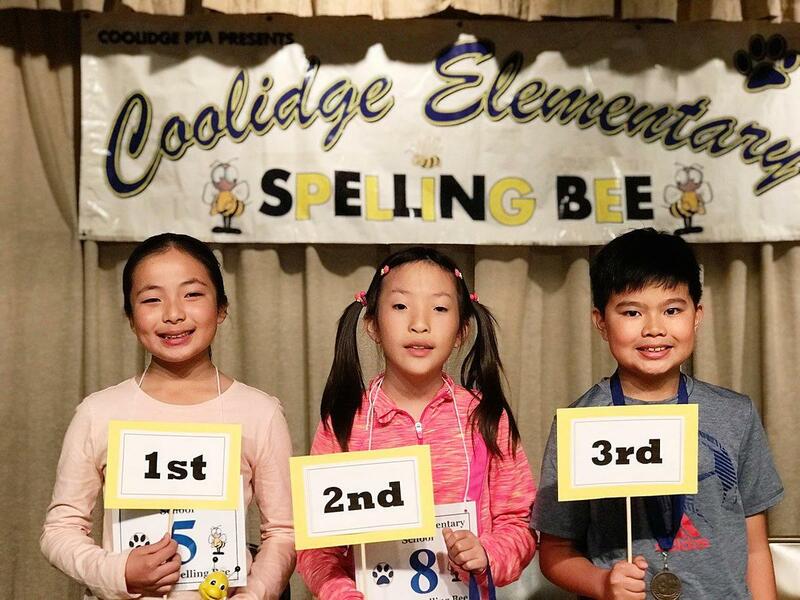 Coolidge’s Parent Teacher Association will sponsor Yan, who will represent the District in the Los Angeles County Elementary Spelling Bee at 4 p.m. Wednesday, March 13 at the Almansor Court Event Center in Alhambra.